Hey there friends. Had the priviledge of giving a graffiti lesson for Dillon who turned 14 at the end of October. Supa nice guy and it was a pleasure telling him some history of graffiti, chatting about his interests and his art aspirations. I painted up a quick demo and then him use the cans for the first time. He had a blast and will be painting his own canvas solo very soon. Always good to pass on good vibes about this great art form. Hey Peeps. Its been a while. Been sup busy working as a screen printer, Ive completed cert 4 in Graphic Design. Ive also painted Bondi Beach promenade with fresh Sydney artist “Mistery”. Painted in Coffs Harbor with my old friend “Snarl” and recently did a Baby Looney Tunes wall for a upcoming baby. All have been a great positive for this year. Ive also got my clothing label up and running. DFunk streetwear. Check out dfunkstreetwear.com and purchase some gear. Hi peeps. Had a blast Sunday just gone. 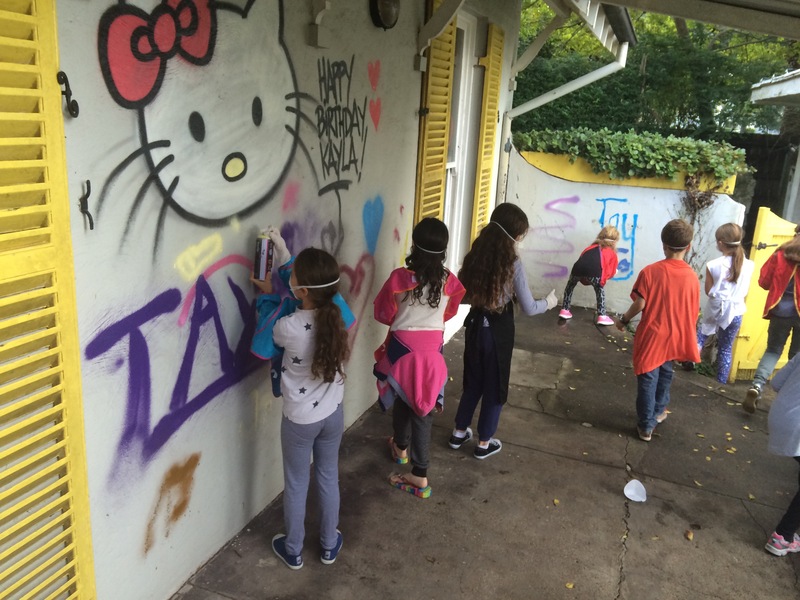 I attended an 8 th birthday party and held a graffiti workshop for the birthday girl and 40 of her friends. It was in Double Bay here in Sydney and her parents had purchased an older property and are demolishing and rebuilding. 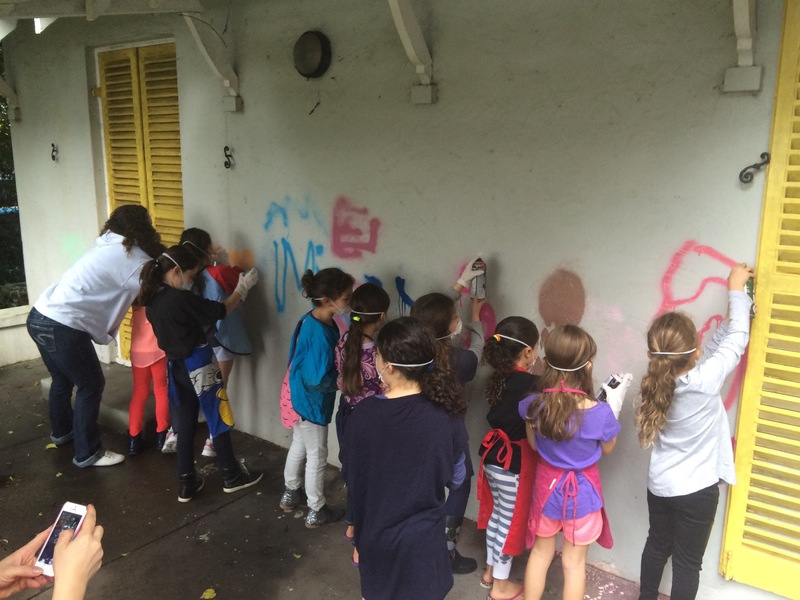 They got me to hold a graff workshop for the kids. It was a tonne of fun and the 40 young girls were eager to grab the cans and get busy. They had a blast and soon enough all the walls at the back of the house, the garage and the boat shed were smashed with their scrawlings. Donned in latex gloves, aprons and dust masks they went about coloring the house, the trees, birdbath and anything they could apply paint to. Good fun. Maybe its started a new generation of female writers for the Sydney scene? *safety first. Some of the action below. Hi there friends. Hope you all had a great Christmas and New Year. I hope 2015 is everything and more you all expect and hope for. Ive just returned from a supa 3 day adventure to Coffs Harbor on the NSW North Coast. Had a great time with my partner Alysia and her son Nate. I also caught up with my old friend Snarl. We had a paint at his studio ‘Open Studio’ and caught up for a beer before we came back to Sin City. It was an awesome getaway and we had a tonne of fun. Meanwhile Ive put together some sticker packs of some of my designs and an A4 hard cover photo book of some of my work from over the years. Check out my for sale page for these items. They are listed there for purchase. Hi ppl. Had a fun gig last week. I did some scenic art and stand by set dressing for SBS Sydney and their up coming announced production ‘The Principal’ starring Alex Dimitriades. I applied the graffiti straight onto the wall of the class room and then had to reset the room back to its original condition. The set was for the publicity shots. It was a heap of fun and I met some amazing people. Be sure to check it out mid year in 2015. Hey there people. Alysia and I walked the red carpet for the world premiere of Angelina Jolie’s feature film ‘Unbroken’ which is about the life of Olympic hero and WWII war veteran Louie Zamperini. It was VIP black tie and we were greeted upon arrival with champagne and supper boxes. Held at The State Theater in Sydney in was an awesome night and very exciting to see the sets I worked on. Hi there friends. Been keeping things moving in the last week or so. I was down at Manly Vale here on Sydney’s Northern Beaches last week and did the legal wall at Manly Vale skate Park/Oval. Put up a nice Desta piece with a special appearance by the one and only Captain Underpants. Great character of childrens books of the same title with sub titles of what adventure he is on. I also was commissioned this week to do a canvas for a girl’s 13th Birthday. Taylah’s completed canvas is on my Custom page and check out the Wall page for Captain Underpants.